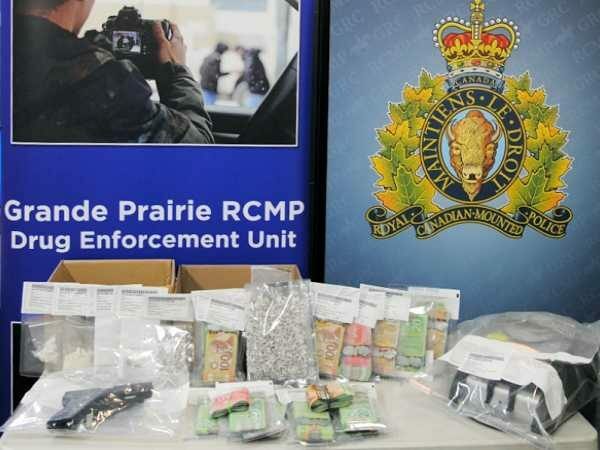 Grande Prairie, Alberta – On Friday, February 8, 2019, Grande Prairie RCMP Municipal Drug Section, with the assistance of; Western Alberta District Crime Reduction Unit (WAD CRU), Municipal Crime Reduction Unit (CRU), General Investigation Section (GIS), General Duty members and Police Dog Services (PDS) executed search warrants at three separate locations in Grande Prairie. As these matters are now before the court, no further information will be provided. Grande Prairie RCMP is committed to increasing community safety by using a crime reduction strategy that focuses on identifying repeat offenders, gathering intelligence, and conducting enforcement initiatives. RCMP would like to thank the public for their assistance. If you’d like to report a crime, please call the Grande Prairie RCMP at 780-830-5701 or call your local police detachment. If you wish to remain anonymous, you can contact Crime Stoppers at 1-800-222-8477 (TIPS), online at www.P3Tips.com or by using the “P3 Tips” app available through the Apple App or Google Play Store.